Discover a quieter side of Napa on the Silverado Trail. Day 2 agenda for first timers to Napa uncovers the BEST wineries, restaurants, and picnic spots. Local Wally's Napa Tourist Guide. In a way the Silverado Trail, once a wagon trail for the silver mines, is like how all of Napa used to be. The crowds are fewer, the traffic more manageable, it's a leisurely drive in the country dotted with quaint wineries and friendly tasting rooms. Oh sure, there are a handful of gargantuan wineries but you'll mainly find smaller, more intimate experiences with a family run feel to the wineries. Because there are no restaurants along the way you'll also want to pack a picnic lunch before you go. But that's just fine with me as a Napa picnic is just perfect for a laid back day in wine country - and do I have the perfect spot for you! Like the big names on Highway 29, most of these wineries offer no coupons or discounts but no worries, in the next section is a Napa on a Budget agenda. Boy, I think of everything! Click to Get a Wine Pass and Never Pay Full Price For Wine Tasting Again! When Did Wine Tasting Get So Expensive? I know what you mean! Napa wine tasting used to be something you would do when you had nothing else to do but today it demands serious research unless you have money to burn. I tried to mix some essential big name wineries with some discounted ones on this agenda so you can see it all without breaking the bank. Forget about searching for coupons (lots of fakes out there) and don't waste your time on the various city passports or phone apps, instead just get a Priority Wine Pass and enjoy two for one's and other discounts. I don't own the wine pass company, I just highly recommend it to my readers who are looking to do Napa on a Budget. Order here, one per couple. Located in downtown Napa, the Oxbow Market is a gourmet food emporium with stall after stall of good eats. During the day the crowds pack in for options such as Hog Island Oysters and Gott's Roadside but in the morning the place to be is The Model Bakery. It opens at 7:30AM and offers breakfast items - their English Muffins are legendary. Picnic tables outside, Stumptown coffee, good morning to you! The Model Bakery also has picnic lunch items "to go" or check out The Fatted Calf, a high end deli where you'll find gourmet smoked or cured meats that will go great with a baguette. On Tuesdays and Saturdays there is also the Napa Farmers Market across the street, a great place to pick up some fresh fruit to go with your picnic. 10:30: Get Ready for Your Selfie - Beautiful Setting! Andretti Winery is owned by famous race car driver Mario and it's my favorite first stop. The wines are easy to sip in the morning and the winery is picture perfect, an old world sort of setting that transports you to a European villa somewhere. Lots of areas to spread out, including a nice outdoor patio and grassy area in case you were foolish enough to bring the kids. And if you are really foolish enough to be in charge of planning that bachelorette party then email me as I can totally hook you up for an event here. Tastings are $30 per person but two for one with the Priority Wine Pass. Regusci Winery doesn't hit too many tourists' radar which is why it's such a great stop. Fans of big reds will swear their love to Regusci as will romantics who won't be able to resist the appeal of this winery tucked away on the hillside like a Tuscany chateau. Take the drive up the dusty road past the mature olive trees and be prepared to be swept away. The impressive stone building dates back to the 1800's, one of the original wineries in Napa. It managed to stay afloat during prohibition becoming a part time dairy and part time wine bootlegger, and in 1932 was sold to the Regusci family who did a loving restoration. You'll love everything about Regucsi, from dog in the sun to the guy in the kilt serving wine. $50 pp. Mumm Napa is less of a educational tasting experience and more of a kick back champagne sipping one and that's fine with me. Enjoy a flight of different sparkling wines in their modern tasting room or better yet head outside to the patio for views of the vineyards. Tours at 10am, 11am, 1pm and 3pm, no reservations required, additional fee. Make sure you explore their free photography exhibit featuring black and white prints by great artists such as Ansel Adams or other rotating photographers. Oh how Audrey Hepburn you look sipping champagne as you stroll through the art gallery. Tastings start at $25 per person. 1:30: Up the Mountain We Go! Let's get off far off the tourist trail and head up the hill to Burgess Cellars, one of Napa's hidden gems. The quaint tasting room is a throwback to the 70's when every tasting room was just a bar surrounded by barrels - real barrels of wine, not props. The view is simply stunning and the wines even better. Look, I might not be a somm or even close but I do drink a lot of wine and in my book these wines could easily sell for twice their price and no one would argue. Here's where that wine pass really pays off. Tasting are normally $30 per person and waived if you buy 6 bottles, or a full case for two people. Use your Priority Wine Pass and get 2 free tastings with a 2 bottle purchase. 3:00 Fun and Funky Dutch Henry is the Perfect Last Stop! Who needs a fancy pants winery at the end of the day? Let's go to Dutch Henry, one of the coolest and funkiest wineries in Napa. The industrial setting sets the tone and outside are picnic tables, a bocce ball court, and lots of picnic tables. Were you smart enough to get some bread and cheese earlier in the day? I certainly hope so because this is the type of winery you want to stay at until they remind you they're closing. 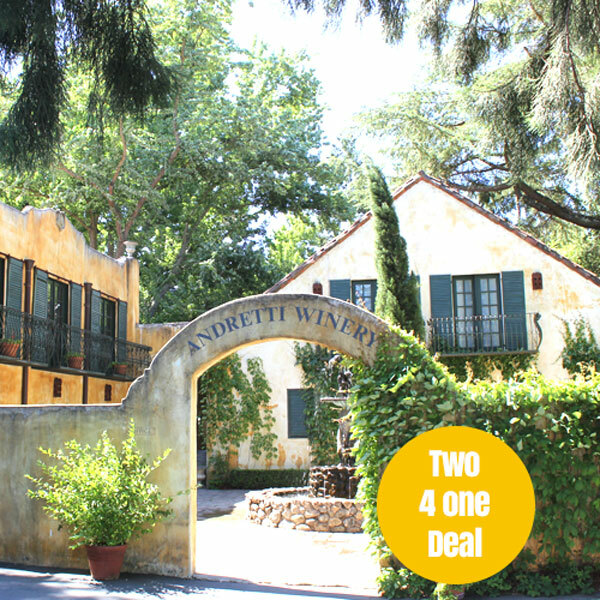 Priority Wine Pass members get two for one's here, saving you $25 per couple. Since you are up near Calistoga you might want to pop into SolBar, a Michelin star restaurant inside the Solage Resort. Evangeline is another really solid restaurant for a bit of French Bistro meets Creole cooking. You can also head back down south if you are staying in that area and hit up a restaurant on the way back. I am never turning down dinner at Rutherford Grill - their grill artichoke is the absolute best in the world and a seat at the bar prime real estate. Another great spot is Farmstead at Long Meadow Ranch, a casually upscale dining experience with great food and atmosphere. And no one would fault you for stopping in at St. Helena and going to Market, a local favorite with moderate prices and upscale comfort food. If you did this agenda without a Priority Wine Pass you would pay $320. Whew, that's a ton! If you bought the $39.99 pass (you only need one pass) you would pay $205. Add the cost of the pass and that's $245, so a $75 savings. Hey, not a ton of money but that could pay for dinner, right? If you want the pass go to my discount link to save $20 on the pass and only get ONE pass per couple. Sure you can pick your own. But there you go again, down that rabbit hole of which winery, who has deals, where to go, oh no, so many to choose from, overwhelmed!!! Chill out, just pick from my list below if you want to mix and match. Pay attention to the wineries with the yellow dots if you have the Priority Wine Pass because they have the best deals. It's an adventure, from the scenic and winding drive to the winery to the golf cart cruise to the caves. Once inside it's all private and small groups surrounded by barrels, And yes, you get to taste straight from the barrel so that's something! This would be one of my top picks in Summer, get out of the heat and away from the crowds and taste like a big shot in the caves. Normally $65 per person, only $50 per person with your Priority Wine Pass. Good for: Barrel tasting experience, great caves, especially great in Summer. Auburn James makes some of Napa's finest reds and you can taste inside their cute winery cottage. Private tastings for groups up to 8, you sink deep into their comfy couches and sip away after taking an optional short tour of the vineyards and production area. No waiting in lines, no fighting for attention, this is a fun way to relax while tasting some truly fine wines. $30 per person, or two for one with the Priority Wine Pass. Reservations required. So much to love about Brian Arden Winery. First, the main bunch of tourists haven't yet discovered it so the tasting experience is nice and relaxed. Second, the winery is new, cool, and contemporary so if you like chill, well, you will chill out here. Third, there are plenty of wine choices here and everything they seem to make is so delicious that it's hard to leave. Standard tasting is $30 per person, or two for one with your Priority Wine Pass. Good for: Those who want lots of wine options, from whites to rose to reds - all fantastic! Those who know Napa history (or who watched the movie Bottle Shock) will remember that Chateau Montelena was the winery that made the winning Chardonnay in the Judgement of Paris blind tastings - you know, the one where they thought they would kill us and ended up with their tails between their legs. The castle-like exterior is as incredible as their wines and the goofy lake in back with Asian design is, well, goofy. Go see it! Good for: Wine buffs, or those looking for truly unique wineries to visit. If you love cabs then you need to get in here! While Chimney Rock makes whites and a nice rose it's mainly about the big Napa reds when you taste here. Great bar setting and outdoor space, golfers might imagine hearing the distant cries of "fore" since the winery is build on what was once a golf course. Standard tastings are $50 per person but those with the Priority Wine Pass get FREE tastings with the purchase of just two bottles. Good for: Red wine lovers and lovers in general. I'm a huge fan of the Conn Creek Blending Experience where you learn all about nuances of wines grown in different parts of the valley and then blend and bottle your own to take home. You get $50 off per couple with a Priority Wine Pass, dropping the fee to $100 per person which isn't bad when you realize you get to take home a bottle as well as taste again at the bar when you're done. Wine and food pairing discounts with the pass as well. Reservations required. Good for: Anyone who wants to learn a bit more about what they like in their wine. Whether inside at a table our wandering through their gardens, Duckhorn Vineyards is one of the prettiest settings in Napa. Tastings are done table side - no fighting at the bar. And the elegant setting extends to the veranda, a perfect spot with a summer breeze. Save time to wander the gardens and to pretend that this is actually your house. Tastings start at $40 per person and require reservations. I still love Frank Family Winery, now more for their wine than the experience. You see, back when these guys were nobodies they were the craziest winery in Napa with F bombs flying as the servers drank the wine straight from the bottle. But things change and I'm guessing someone in HR said "You can't do that!" and well, when they moved into the more substantial historic winery all that's left is the wine. And that's enough, though I do miss the humor. $40 pp, call ahead. Good for: Great wines, no appointment needed M-Thurs. I love Frog's Leap! Frog legs were once a big thing (well, I guess they still are if you are a frog) in San Francisco. When we all came to our senses the land and farm was re-purposed into a winery, one with a grand sense of humor. The tasting and walking tour through the farm is the way to go ($35 per person) but you can also just taste in their garden for $25. Reservations required for all, this is probably my favorite tour since it's so much fun. Good for: Casual winery tour, kickback wine tasting. I love finding wineries off he beaten path and Judd's Hill certainly qualifies as a winery less traveled, one that doesn't have tour buses lining up outside. Taste inside with the barrels or splurge on a wine and food pairing experience. Located near the south tip of the Silverado Trail, Judd's Hill is a good pick for the first day when you get in a bit late but still want to hit up some wineries. 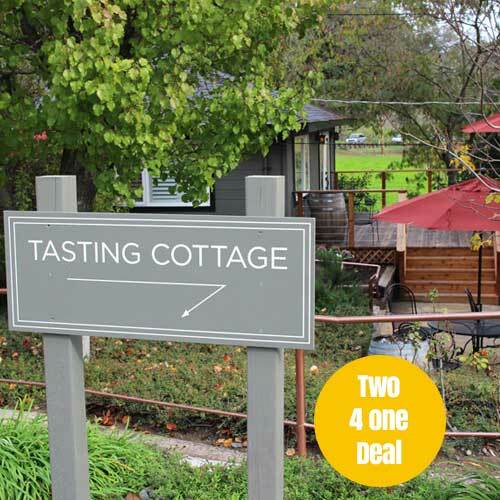 2 for 1 tasting or $35 off per couple for the food and wine pairing. Save $35. Good for: Easy going tastings away from the crowds. Maxville Winery is new, huge, and beautiful. In fact, stunningly beautiful, from the contemporary setting to the location on a hillside far away from the maddeining crowds. This is the perfect getaway, a destination winery that you're going to fall in love with. You might have the winery all to yourself, which might seem odd at first but you'll soon grow accustomed to it and will never want to get back in lines! Tasting and cave tour is $65 per person, 2 for 1 with Priority Wine Pass. Good for: Long afternoons, sipping wine and looking at the view. If you love chardonnay you probably know all about Rombauer, the guys who pretty much invented the "buttery" chardonnay market. If you don;t know what I'm talking about some white wines are "crisp" and even tart/acidic. But not Rombauer, whose chardonnay is rich and creamy and has that distinctive flavor that is often imitated but never achieves. Rombauer also has one of the best hidden picnic spots in ttheir gardens. Very nice! $25 per person for standard tasting. Good for: Picnics and chardonnay fans either one works! You've seen their wines in your supermarket but you probably haven't tasted their really nice stuff. Now is your chance. Silverado Vineyards is located on a hillside with nice views of the valley. With a large patio and tasting room it's a perfect place for perhaps a less serious tasting experience where all you want to do is kick back and sip. Get two for one reserve tastings with the Priority Wine Pass, save $45. Reservations required. Good for: Summer afternoons on the patio, Silverado Vineyards is the pace to be.